Mom, the Intern: The grossest things I can't resist eating. The grossest things I can't resist eating. Have you ever been chowing down on something and then had the thought, "This is so nasty but I can't stop eating it?" If you're a human being, probably. If you're an animal, woof woof chirp chirp meow (I hope you speak English). But anyway, I was eating some (read: too many) Tootsie Rolls last night when the thought occurred to me that Tootsie Rolls are kind of ... gross. They don't have much flavor and the consistency is a little plasticky. According to Wikipedia, they contain "sugar, corn syrup, partially hydrogenated soybean oil, condensed milk, artificial cocoa flavoring, whey, soy lecithin, orange extract, and natural and artificial flavors." The first three ingredients are HUGE nutritional no-no's (partially hydrogenated ANYTHING = trans fat) and then, what? Artifical cocoa flavoring? You mean, FAKE CHOCOLATE. Don't church it up. Also, I own some soy lecithin and it's just another type of oil. And orange extract?! Who knew? But, I'm ashamed (or maybe not so ashamed) to admit that I ate roughly 20 Midgees in one sitting. Because they are so good, I can't stop eating them no matter how bad for you they really are. Here's my list of "Gross Things Jenna Can't Resist Eating." Feel free to make your own and link up. 1. 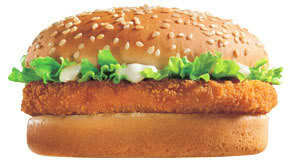 Hot n' Spicy McChicken. I have a love/hate relationship with the $1 Hot 'n Spicy from Mickey D's. Remember how this sandwich put me into labor with Smush? Yep, my Hot 'n Spicy habit started long before that. I used to eat them bi-weekly in high school -- I was obsessed. But they are extremely spicy and usually give me heartburn. And when you think about what they really are, it's kind of disgusting: two dry, basic buns; a thin, "chicken" patty coated in the spiciest breading known to mankind; limp, lifeless shredded lettuce and heaps of mayonnaise. Yumm-o! But for some reason, whenever I go to McDonald's, I can't bring myself to order anything else. Even if I have to inhale it in three bites to avoid massive burns on my esophagus. 2. Puffy Cheetos. In college, I worked at the BYU Bindery. Which is exactly what it sounds like -- a place where books are bound. It's this noisy warehouse located at the north end of campus. It wasn't exactly slave labor but it was pretty close, and I almost lost my finger to a conveyor belt one day. But I needed a job so I took it. Anyway, at the bindery we had this huge tarp-bag with a tube on the end hanging from above and it was filllllllled with biodegradable packing peanuts.We'd use it to pack boxes of books and things for safe travel. One day, one of my co-workers decided that our packing peanuts looked mysteriously like puffy Cheetos, minus the orange cheesy dust. So as an experiment, he took a bite of one as the rest of us looked on in awe. His conclusion: "Yep, puffy Cheetos minus the orange cheesy dust." 3. Twizzlers. 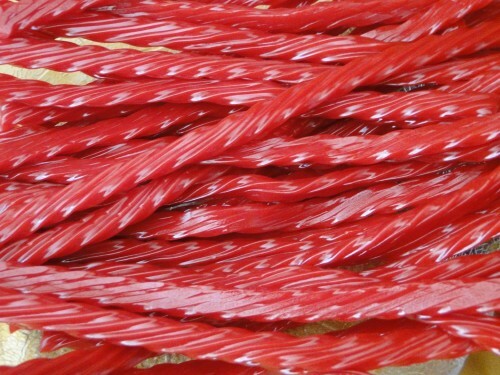 Is it just me, or are Twizzlers basically wax mixed with a little sugar and flavoring? I decided to do a little investigating and found that the Twizzlers Web site is (perhaps intentionally) cryptic about the ingredients of their product. See for yourself. Guess I'll have to buy a package to find out! Not that I'll mind. 4. Conversation Hearts. Every year around the middle of January, I start buying those Brach's Conversation Hearts to put in a candy dish on the kitchen counter, and EVERY YEAR I end up having to buy about 10 bags to keep the dish replenished because I am a Conversation Heart addict. It's true. What are they, packed sugar in the form of a heart? Yet I cannot stop eating them. But why??? They're not even that good and they wind up stale within a day of opening the bag. They're so festive, though. I can't help it. 5. Canned cheese. I'm beyond embarrassed to admit this, but one time I bought a can of Easy Cheese and I ate the WHOLE THING that night. In one sitting. I don't even think I used crackers -- I just stuck the spout in my mouth and chugged it down! WHY?! It's an aerosol can of CHEESE-LIKE substance. And it's "easy." Why couldn't I have indulged in a cheese that's willing to play hard to get? Take a look at the nutrition facts. "Cheese" is listed as the second-to-last ingredient. Which means, if my memory of 4th grade science serves me right, there isn't a whole lot of actual cheese in there. Also: one can contains 630 calories. What are the nasty foods you can't help eating? HAHA I had to laugh at all of these. 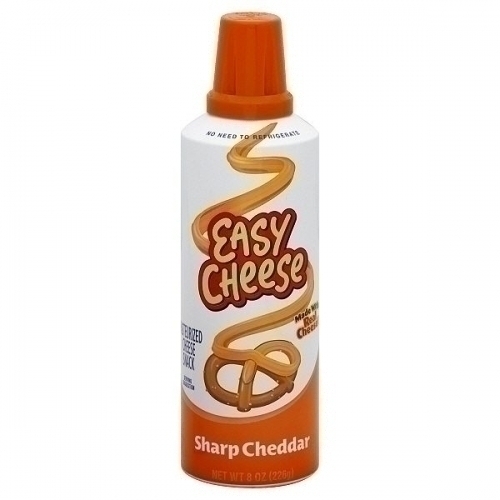 I can relate to the easy cheese (though I haven't bought it in over 2 years because I'm known to eat the whole thing, too.) Everything else though, I haven't wanted to eat in forever! I don't see any point in candy unless it is dipped in chocolate. I prefer poisoning myself with Arby's beef and cheddar sandwiches, curly fries, and anything fried with avocado on it. :) Too funny, I love your list! I may try this out on my blog! bahahah I love this post. Your blog is so hilarious sometimes. My biggest friend/enemy when it comes to junk food is Flaming Hot Cheetos. Don't even get me started on the heartburn or stomachache that consistently haunt me after I eat these, or the bright red food coloring dye that ends up on my fingers so everyone knows what I've done, but I cannot help it! They are seriously the only thing I ever crave. I love lays sour cream and onion chips... and buffalo wings... and ice cream with chinks of chocolate or cookie dough or candy bars in it... and I love spicey chicken sandwiches too, but my fave is the one from Wendy's... and I really love Pizza Hut pan crust pizza, which is probably the greasiest thing ever. I like anything sweet, except chocolate. I only crave chocolate when I'm pregnant. I can't keep sweets in my house or I eat them up! Chocolate covered raisins are an exception. I can eat a whole bag of those! I am so glad u r brave enough to share this! I have a guilty list too :) but don't we all? Mmmm, soda, Twizzler Nibs, pop-tarts, sour cream and onion chips, and really anything sweet, especially when I'm pregnant.. I am addicted to natural cheetos, white cheddar. Delish!!! I could eat taco bell everyday, whatever they put in the nacho cheese sauce, yum!! And I can down a full bag of doritos in one sitting. Seriously, Jenna? Yeah...pretty much all of your list I find disgusting. Well, minus the spicy chicken - but only from Carl's Jr. I never eat at McD's. Um...I like my share of junk food. But I don't know what I would consider totally gross foods. I'll have to think on it. I'm sure I'm ingesting some seriously wrong things. I eat some gross stuff, too, like any kind of cheese- even "government cheese." I just love dairy, fake or real! I 100% agree with you on the Hot n Spicy from McDonald's. Haha! This is hilarious. I want to do one of my own. The first thing that comes to my mind is flaming hot cheetos. They stain my fingers red, kind of give me a stomach ache, and don't even taste like any kind of real food known to man. And yet, my love for them runs deep. I came up with something - hot dogs. They taste so good, but are seriously gross when you think about what is in them. Bwahaha. I used to love eating all of this. Unfortunately, my weight has spun out of control so I've cut out the junk food and now eat [mostly] healthy stuff. Twizzlers and McChickens though...oh so bad for you but mmmm I loved them. Mine has to be hot dogs. In fact, I don't actually want to know what is in them. They are so delicious, that I'll probably eat them even if I knew, but ignorance is bliss. I also can't seem to resist Spam. I know it's evil, but lightly toasted or seared on each side, it's just SO good. Bad, bad mommy! Suddenly my bowl of cereal for breakfast seems a whole lot healthier. I'm also a conversation heart fan, but they must be Necco brand. Yum! In fact, I've given up waiting for January/February. I just buy Necco wafers instead anytime of the year I want. C'mon. What's better than instant gratification? This is too funny! Well, I'm beyond addicted to eating icing...just icing. It's so bad but soooo good! OMG! I am a snow caps addict lately. I can literally eat them until I am shaking with a sugar and caffeine high. I asked my husband last night if he thought the antioxident benefits I was getting in the dark chocolate outweighed the fat I was consuming. He didn't tell me what I wanted to hear. In college, my roommate and I survived on Easy Cheese and Bugles. Match made in Calorie Heaven! After finding out exactly what was in hot dogs during Junior High (darn my science teacher), I haven't let another one cross my lips. My junk food favorite is Rice Chips ~ love them! I read the ingredients on everything ~ just out of curiosity as to what companies think constitutes food ... it's pretty funny (and a bit mind boggling!). I always thought twizzlers tasted like wax. I don't see how people like them. And ugh those candy hearts are gross too. I can't talk much considering I like sushi lol. 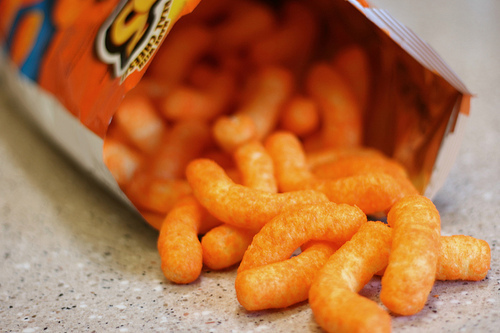 Now I'm craving for a bag of cheetos and some sour cram chips - my comfort food. Happy SITS Day! Nothing on your list tempts me. But with a few very slight alterations, I could compose my own list. Good and Plenty (rather than Twizzlers). 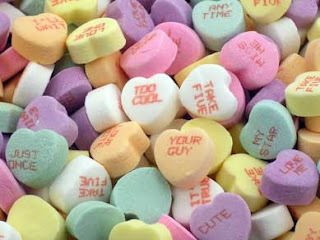 Smarties (rather than those candy hearts). You and I are like Jack Sprat, who could eat no fat, and his wife, who could eat no lean. OMG You are disgusting. All of these items are terrible and you should really rethink your diet. That being said, I happen to love maraschino cherries (were they ever real cherries? ), pork skins (although I eat these in secret, because it's just too gross, but I guess my secret is out), and when I go to the movies alone, I drown my popcorn in that sticky yellow stuff that's supposed to be butter.